The following poem is from the compilation Garlands of Grace, selected and introduced by Dr. Regis Martin. It is especially pertinent on this wonderful Easter Sunday. Streamed through the soldier's sword. At the robin-time of the year. Of drums and the trumpet blast. So shall you come to me. Here is my Q&A for the Easter Sunday bulletin at my church. 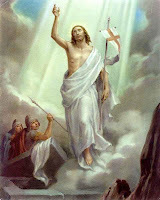 I thought it fitting on this day to answer a question about the resurrection of Jesus. Please note that, with only the space of a column to work within, I had to cut out a lot of information (for example, why the New Testament is trustworthy as proof of the resurrection) and additional proofs. I would expand upon it here but honestly, I'm enjoying my time away from the computer. I think that, as it is, this post is at least a good start. For more information, I highly suggest Peter Kreeft's "Evidence for the Resurrection of Christ," a chapter from his Handbook of Christian Apologetics that you can read online. What proof is there in the resurrection of Jesus? First, let's outline what happened. The Christian claim is that Jesus of Nazareth, a Jewish prophet who claimed to be the Messiah, was arrested, condemned by Pontius Pilate, and crucified. He was placed in the tomb of Joseph of Arimathea, which was sealed with a large boulder and guarded by Roman soldiers. Three days later, some women who went to His tomb found the boulder removed and the body gone. In a span of 40 days, He appeared to over 500 people and then ascended into heaven. But, is it true? As is my custom every Easter, watch and enjoy the Solemn High Mass for Easter Sunday, 1941, with narration by Fulton J. Sheen. 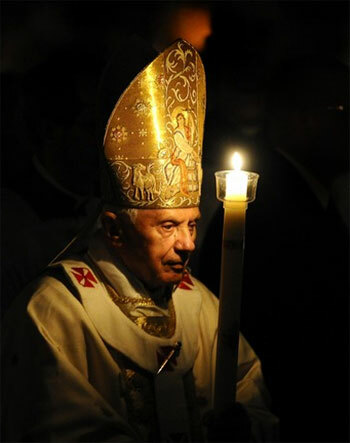 There is no better man to explain the mysteries of the Latin Mass ... and as they happen! Why Is the Wednesday of Holy Week Called "Spy Wednesday"? Today is called "Spy Wednesday" because the Gospel reading for today (cf. Mt 26:14-25) is about how Judas agreed to act as a spy for the Sanhedrin and hand Jesus over to them for 30 pieces of silver. 14 Then one of the twelve, who was called Judas Iscariot, went to the chief priests 15 and said, "What will you give me if I deliver him to you?" And they paid him thirty pieces of silver. 16 And from that moment he sought an opportunity to betray him. 17 Now on the first day of Unleavened Bread the disciples came to Jesus, saying, "Where will you have us prepare for you to eat the passover?" 18 He said, "Go into the city to a certain one, and say to him, 'The Teacher says, My time is at hand; I will keep the passover at your house with my disciples.'" 19 And the disciples did as Jesus had directed them, and they prepared the passover. 20 When it was evening, he sat at table with the twelve disciples; 21 and as they were eating, he said, "Truly, I say to you, one of you will betray me." 22 And they were very sorrowful, and began to say to him one after another, "Is it I, Lord?" 23 He answered, "He who has dipped his hand in the dish with me, will betray me. 24 The Son of man goes as it is written of him, but woe to that man by whom the Son of man is betrayed! It would have been better for that man if he had not been born." 25 Judas, who betrayed him, said, "Is it I, Master?" He said to him, "You have said so." A spy is someone who acts like he is trustworthy when all the while he is plotting to betray you. Judas did that when he said "Hail, Master!" and gave Jesus a kiss -- which is the greeting of a friend -- when really he was giving the chief priests the sign to arrest Jesus. He says, "Is it I, Lord?" as if he is innocent, but there is no one more guilty. 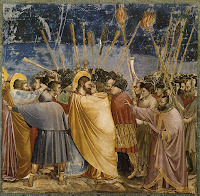 May we all be more like the beloved apostle, who stayed ever at the side of Christ throughout His Passion, and less like Judas, who betrayed the Lord for the price of a slave. It's not a new term; it's the English translation, which goes back to at least the 19th century, of an Irish term that goes back at least to the early 15th century. The translation is a bit shaky. "Ceadaoin in/an Bhraith" meant "Betrayal Wednesday". But "braith" also meant someone who observes or spies. (Two different verb rootwords, spelled and pronounced the same.) So Betrayal Wednesday was translated as Spy Wednesday. I don't have time to post a great deal today, but I wanted to at least point you in the direction of some resources that you could use to learn something new about Jesus' amazing entrance into Jerusalem and the great mysteries of His Passion. I also threw in a few activities for children (why not, right?). And they brought the colt to Jesus, and threw their garments on it; and he sat upon it. 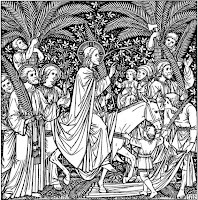 And many spread their garments on the road, and others spread leafy branches which they had cut from the fields. And those who went before and those who followed cried out, "Hosanna! Blessed is he who comes in the name of the Lord! Blessed is the kingdom of our father David that is coming! Hosanna in the highest!" 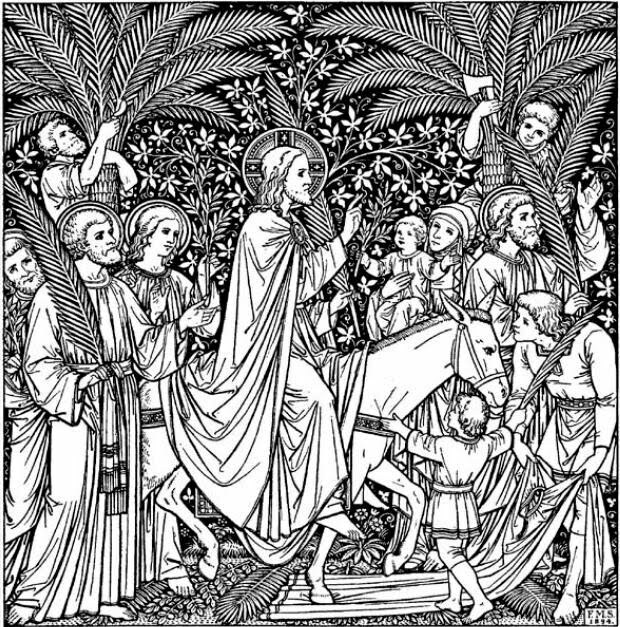 Did Christ Ride Two Animals or One Animal on Palm Sunday? Saint Patrick was born in Kilpatrick, near Dumbarton, in Scotland, in the year 387 AD. When he was 16, he was captured by pirates from Ireland and sold into slavery there. For six years, he tended the flocks of his master. While a slave, he prayed 100 times a day and the same every night. Regardless of the weather or the time, in the woods or on a mountain, he was always praying. Providentially, his time in captivity became a preparation for his later work as bishop and evangelist. He learned to speak the Celtic language, and, because his master practiced Druidism, he became very familiar with the religion that he would almost single-handedly replace with Catholicism among the people of Ireland. A vision of an angel compelled him to leave his master and flee to England, where he studied at a few monasteries and eventually became a priest. With St. Germain he preached against the Pelagian heresy. Together they performed many miracles and converted a great number. The Pope, so impressed by Patrick, sent him to Ireland to convert the Irish people to Christianity. 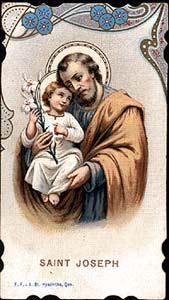 Before Patrick set out on his mission, he was made a bishop. When he arrived in Ireland, one of his first acts was to visit his former master, pay the ransom owed him, and give him a blessing and forgiveness for his cruelty as a master. On several occasions, Patrick met with violent opposition by the Druid chieftains. When one of them tried to kill Patrick with a sword, Patrick make his attacker’s arm immovable and did not relieve it until the attacker pledged obedience to Patrick. He eventually converted his attacker and every Druid chieftain and king who sought to kill him. Everywhere Patrick went, he converted people by powerful preaching and miracles. He also formed several parishes and dioceses throughout Ireland. He ordained priests, healed the sick, expelled demons, and brought the dead back to life. Through boundless prayer and severe penances he sought the salvation of Ireland. He continued until his death to visit and watch over the churches he had founded throughout all the land. 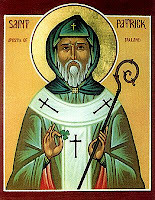 Patrick is the one who first used the shamrock as a tool for teaching the Trinity. “St. Patrick’s Breastplate”, a prayer he composed on the morning of a great victory over paganism, remains to this day a popular Catholic prayer. He is called “The Apostle of Ireland” because of his tireless evangelism in that land, and is one of the Church’s greatest saints. National Catholic Register: St. Patrick, Pray for Us!